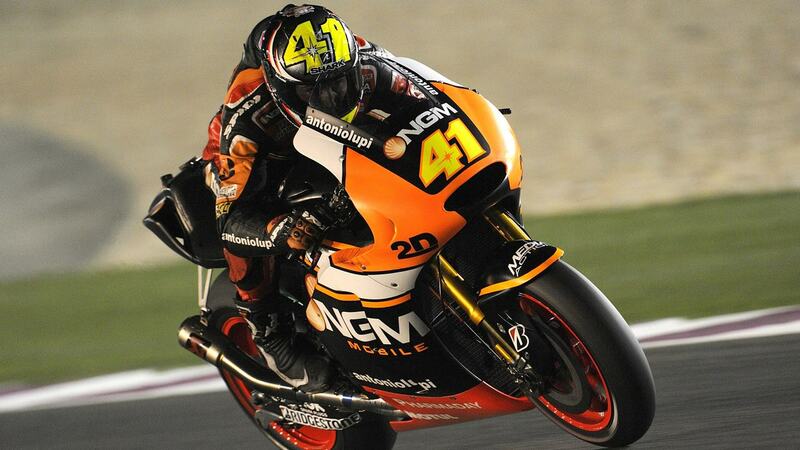 NGM Mobile Forward Racing’s Aleix Espargaro continued his impressive form from the Qatar pre-season test to top the first three Free Practice sessions at Qatar’s Losail International Circuit, ultimately setting a best lap time of 1’54.773 to finish 0.413 seconds clear of his closest rival. Espargaro set his time in today’s Free Practice 3 session on the combination of the hard compound front slick and the soft compound rear slick – which is only available to the Ducati and Open-class entrants this weekend. Second overall in the ranked practice sessions was Pramac Racing’s Andrea Iannone, who also took advantage of the extra grip of the soft compound rear to set a personal best lap time of 1’55.186. Third quickest on combined practice times was GO&FUN Honda Gresini’s Alvaro Bautista with a time of 1’55.240 which the Spaniard set on the medium compound rear and hard compound front slick. The desert setting of the Losail circuit makes it prone to wind-blown sand and this caused the usual low grip levels, with the first session of the weekend, FP1 creating particularly challenging conditions for the riders. As more sessions were run resulting in more rubber being laid down on the asphalt, grip levels improved slightly but some riders reported they were still at a poor level during FP3. Despite the typically low grip levels, the combination of the latest MotoGP machinery and the 2014 specification Bridgestone tyres yielded impressive gains in performance compared to last year’s Qatar Grand Prix, with Espargaro’s best time 1.3 seconds quicker than the best FP3 time last year and all riders in the top ten bettering their 2013 mark by at least half a second. Losail circuit places a strong demand on cornering and braking stability and this was reflected in a strong preference among the riders for the hard compound front slick in the first three sessions of the weekend. Rear slick choice was more varied, although almost all riders switched to their softer rear slick option; soft compound for the Ducati and Open class, and medium compound for the remaining Factory bikes, to set a quick lap time in their effort to qualify directly for QP2. Tomorrow’s FP4 session will be important for the teams as it will provide an opportunity to work on setup for qualifying and identify their optimum tyre combination for Sunday’s race. “I’m happy because at the moment I continue to be the fastest rider with the medium compound tyres, just behind the motorcycles that can use the extra soft option. In addition, my feeling with the bike has improved slightly compared to the recent tests. We need to further improve the behaviour of the bike with worn tyres, because after only 3 or 4 laps the rear tyre performance drops a lot. Tomorrow we still have one more free practice session to try to improve the situation, then we will give the maximum in qualifying to try to get a good starting position, even though it will be hard to beat the bike that can use the extra soft rear tyre, which offers an advantage of about 4 tenths of a second”. “Today has not been our best day. We could have improved more but in the first session we had quite a big crash and I have been fortunate that I escaped unhurt and that my shoulder injury did not worsen. The session itself was a bit strange and unfortunately because of the crash we had to use an additional tyre, which makes things a bit trickier now as we have to go through QP1. I lacked grip throughout today because of the track surface, and that did not help. Moreover I was a bit confused after the crash as there were too many thoughts in my head. Nevertheless, I am pleased with how the bike felt and happy that I was able to ride some competitive lap times. There is another practice session tomorrow and I am confident of qualifying well for my first MotoGP race on Sunday, but I am in need of a good rest tonight”. “Today was definitely better: we fixed the problems with the electronics and we were able to take advantage of these two practice sessions. I am comfortable on the bike, although I still struggle a bit going into the corner: every time I try to push more, I lose the feeling with the front end. Tomorrow, during the last free practice session, we will focus on this aspect, trying to improve the situation. Finally, we will try the harder tyre, to evaluate its behaviour”.